The purpose of the Manufactured Home Park Program is to ensure a clean, safe, and sanitary environment within the Manufactured Home Parks in Warren County. 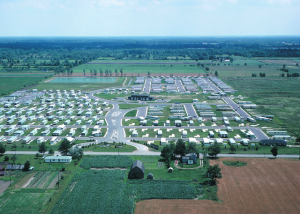 As of December 1, 2012, authority for the routine licensing of Manufactured Home Parks within the Warren County Health District transferred to the Ohio Manufactured Home Park Commission (OMHC). As of January 21, 2018 this authority will be transitioned to the Ohio Department of Commerce. Through a Memorandum of Understanding with OMHC, the environmental health staff conducts at least one inspection per year in each Manufactured Home Park in Warren County. There are parts of the Warren County Housing and Premise Regulations that apply to Manufactured Home Parks that are outside of the scope of the Ohio Department of Commerce that are enforced by local public health sanitarians.